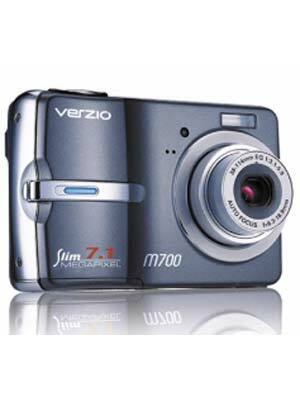 The Verzio M700 camera is a 7.1-megapixel CCD digital camera with a large 2.5-inch TFT display. It has a CCD sensor, 4x digital zoom and 3x optical zoom, built-in flash, an internal 32MB flash memory, a SD/MMC slot, and it has low power consumption with two AA alkaline batteries. The M700 has a higher still image resolution of 0.3M, 2M, 5M, 8M, 10M, and an Image File Format -JPEG (DCF, DPOF, & EXIF). The storage media has: internal built-in 32MB flash memory, External-SD/MMC Card (up to 4GB Compatible), and has auto power off that can be set to off, 1, 3, 5, and 10 minutes. The camera is available in Carbon Black and Titanium Black, and retails for PhP7,990.